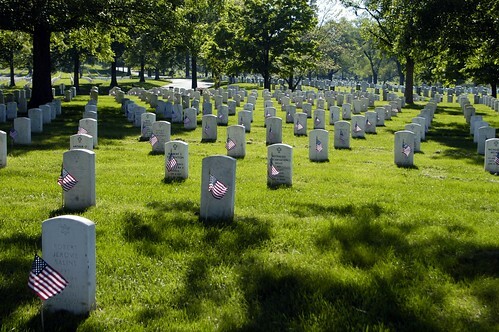 Memorial Day is the day Americans officially remember veterans who died on active duty. My family has a long history of military service dating back to the American Revolution. We’ve had at least one sailor, soldier, airmen or marine serve in every war since then. Some died for their country. We’re not unique; just visit any national cemetery for that reminder. Please observe a moment of silence today and thank these men and women for their ultimate sacrifice. Our ability to enjoy barbeques, the beach or even shopping today is thanks to them. Amen to that! I totally agree (and made sure to make that a teaching moment for my kids as well). Thank you. So many have died gain and preserve our freedoms! We took our kids to the cemetery to put flowers on the graves of Mr.’s family members, including an uncle who served in WWII. We go every year on Memorial day, and our oldest (5 years old) is starting to get the idea. It’s not easy to explain the concept of death to young kids, let alone war. We hope that as they grow, they appreciate the meaning of the day; it’s a solemn event for us, not a time to buy cheap mattresses and have beach parties. Good point about how so much Americans noted the day. Maybe because I live in a military town, but I think people are more aware of what the day commemorates. That’s what I want to believe anyway. Next post: $2,600 for a bottle of water… thirsty anyone?